Lajos Szabó, who thought in words, and drew not out of passion but with the strength and impulse of his composure, was a committed follower of progressive artistic and social movements. 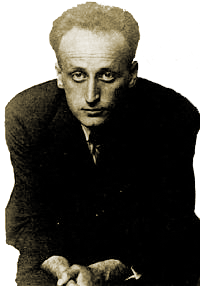 So it was natural for him to join Lajos Kassák's leftist Workshop Munka-kör in 1928, at the age of 26. Being unable to compromise on principles, he left in 1930 to found the “oppo”, the oppositional movement, taking with him some 50 members including Endre Friedmann, later better known as the photographer Robert Capa. The "oppo" movement, based on the “intransigent” Marxism of Karl Korsch (“imported” by Szabó, who held theoretical discussions with Korsch in 1931) had “antiorganisation” as one of its mottos: a position opposing all institutions and institutionalization to which Szabó adhered until the end of his life. He often used the sign AO, for AntiOrganisation, to sign his calligraphies. This sign later became a visual symbol in his work. During this time, he met the thinker Béla Tábor, and the two became friends and collegues for life. In the spirit of self control, a tenet of AO, they travelled the route from Marxism through Freudism to Nietzsche and existentialism, arriving at the dialogical position held by Franz Rosenzweig and Martin Buber, both Jewish, and Ferdinand Ebner, a Christian. They were also deeply influenced by Plotinus and the speculative mysticism of Meister Eckhart and Jacob Böhme. In 1936, Szabó and Tábor wrote the essay Indictment against the Spirit from this standpoint, timed to appear for the Budapest conference of the League of Nations Committee on Intellectual Collaboration. According to them, the precondition of Intellectual Collaboration is the removal of the Chinese Walls which separate the autonomous islands of intellectual life from each other on the one hand, and the intellectual elite from the masses on the other. Therefore they sharply criticise the most influential philosophical movements of their time, which they all deem to be based on autarky: Marxism (and its subdiscipline Fascism), psychoanalysis, positivism and sociology, reserving praise for existentialism only. 1937 saw the appearance of the single issue of Habonim,a Jewish intellectual magazine, with a front page by the artist Lajos Vajda, who Szabó had befriended earlier in Paris, and a lead article by Tábor. Szabó's piece in the magazine was entitled Addenda to a critique of Marxism. The same year he also published the pamphlet The logic of faith . In 1944, Szabó was deported to Auschwitz. He survived. Returning to Budapest, in 1945 Szabó, Tábor and the thinker Béla Hamvas began the “Thursday conversations” at the apartment of Tábor and his wife, the art historian Stefánia Mándy. At the same time, Szabó started giving seminars on psychology, the critique of set theory. He called his way of thinking prismatics, in which the One Spirit shines through the triple prism of Esthetics, Ethics and Logics, characterised therefore by unity of Esthetical, Ethical and Logical evaluation. Szabó left Hungary in 1956, eventually settling in Germany. During his years in exile, calligraphy became the main focus of his creative activity. He exhibited in the Palais des Beaux-Arts in Brussels in 1957 together with his fellow artist Endre Bálint and the artist and architect, later situationist, Attila Kotányi; works of with Lajos Vajda were also shown. Between 1958 and 1966, he had further exhibitions in Brussels and several German cities. His works can be found in a number of museums and private collections around Europe. After a long illness, he died in Düsseldorf, Germany, on 21 October 1967.